Modest Elegant Lined Lace bodice, back and sleeves with satin ruched band at waist and chiffon skirt. Scoop neck and matching sequins adorn the lace top with zipper back. Comes in several colors including light ivory. 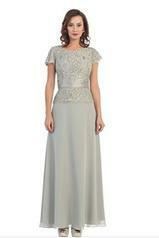 Great informal wedding dress or any occasion. Runs small. No fabric or custom changes available on this dress.